Free Shipping Included! 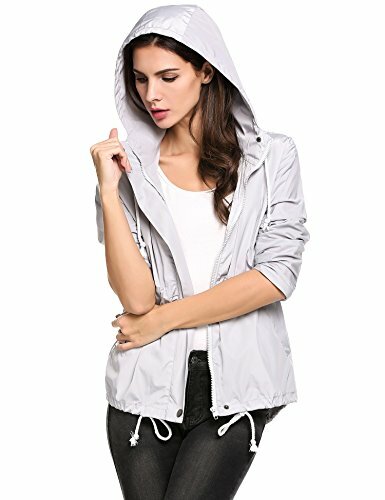 Zeagoo Women's Lightweight Waterproof Rain Coat Hooded Active Outdoor Windbreaker Jacket,Large,Gray by Zeagoo at Lamont Design. Hurry! Limited time offer. Offer valid only while supplies last. Specifications: Please check your measurements to make sure the item fits before ordering. 1. Use similar clothing to compare with the size. 2. *Size S------Raglan Sleeve 27.5"------Chest 41.7"-----Waist 41.0"-----Center Back Length 27.6"
*Size M------Raglan Sleeve 28.1"------Chest 43.7"-----Waist 42.9"-----Center Back Length 28.1"
*Size L------Raglan Sleeve 28.7"------Chest 45.6"-----Waist 44.9"-----Center Back Length 28.6"
*Size XL-----Raglan Sleeve 29.3"------Chest 47.6"-----Waist 46.8"-----Center Back Length 29.1"